Also called regenerative surgery, a bone graft is used to recreate bone and soft supporting tissues lost due to periodontitis. If you have periodontitis, you may be losing bone support around your teeth, and in order to avoid extractions, your periodontist may recommend regrowing the lost bone with a graft. The goal of bone grafting is to encourage the body to rebuild the bone and other structures that attach a tooth to the jaw. First, your periodontist will separate the gums from your teeth in order to gain access to the roots and bone. The roots will be thoroughly cleaned, and the holes in the bone will be filled with a graft material that usually consists of your own bone. After this process is completed, your periodontist will put the gums back in place and stitch them together. Over the next few months, the grafted material will be encouraged to grow, which will fill in for lost bone and soft tissue. A common use of bone grafting is for ridge augmentation. 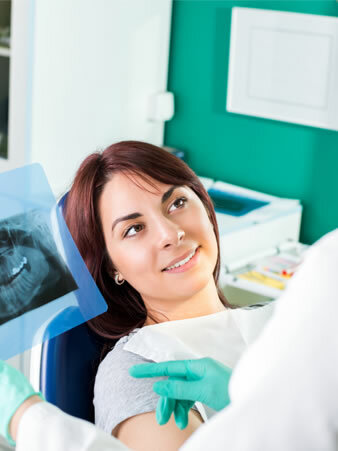 Ridge augmentation can recapture the natural contour of your gums and jaw after the loss of a tooth as a result of trauma, congenital anomalies, infection, or periodontal disease. Achieving an ideal amount of gum and bone as a support to surrounding restorations or implants may require hard and soft tissue reconstruction. After the loss of one or more teeth, your gums and jawbone may become indented where the tooth or teeth used to be. This occurs because the jawbone recedes when it no longer is holding a tooth in place. Not only is this indentation unnatural looking, it also causes the replacement tooth to look too long compared to the adjacent teeth, and this can create an area that is difficult to keep clean. Ridge augmentation uses bone and tissue-grafting procedures to fill in the indented area of the jaw and gums, leaving you with a smooth gum line that coexists with your restoration or dental implant.